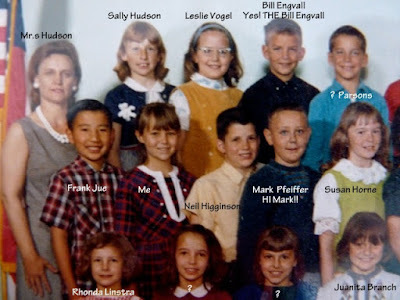 So today, I'm going to let you see a little picture of a piece of my 4th grade class. You aren't going to BELIEVE who is in it.... Bill Engvall. Yes, THE Bill Engvall! I went to school with him and he was as funny then as he is now. When we were in 3rd Grade at Bonnie Brennan Elementary School he played Clementine in the class play. Our teacher, Mrs. Thiel, must have had a little psychologist in her and was able to "lift up" every student in class and make them feel good. That isn't easy but she did it!! Love you Mrs. Thiel. Where, oh where are you today????? Get in touch with me will you?? Without further ado, here is that picture. While you are taking the time to look at it, think about the kids you grew up with... are they out there still? Maybe on Facebook? I've met some of mine there. Reach out, you will be GLAD you did!